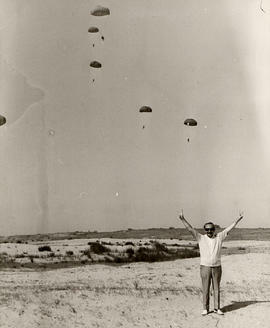 Photograph depicts Ben Wosk standing in a field with his arms stretched up while Israeli paratroopers parachute down behind him. 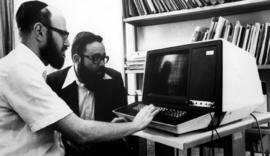 Photograph depicts two unidentified men looking at a computer. Photograph depicts a man walking next to a building on the Bar-Ilan University campus. Photograph depicts Ben Dayson climbing out of archaeological tunnel in Israel. Photograph depicts a group of unidentified men in academic dress with a large certificate. Photograph depicts (l-r) Dr. Leon Kravitz, Canadian Zionist Federation National Executive Director speaking with Canadian Zionist Federation Past President Hyman Besse. Photograph depicts five unidentified men holding a book "The Second million: Israel tourist industry, past, present, future". Photograph depicts three unidentified men at the speaker's table. Photograph depicts two unidentified men at the site of the Canada Science Building while it is under construction. Photograph depicts Dave Nemetz, at Ontario Canadian Centennial Forest in Israel.